President Trump likes to criticize CNN’s coverage of him and his administration via Twitter, during televised rallies and occasionally during televised press conferences. 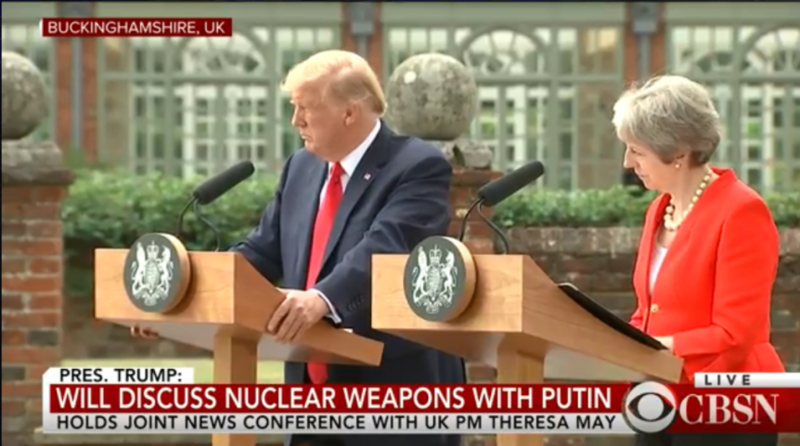 But it’s not often that he insults the network in the middle of a televised presser on foreign soil with a foreign head of state just feet away from him. However, that’s what the president did today, slamming Jim Acosta and CNN this afternoon after the network’s Chief White House correspondent attempted to ask a question during a presser with UK Prime Minister Theresa May outside of her country residence in Chequers, England. Trump called on Fox News chief White House correspondent John Roberts just as Acosta was in the middle of asking the president a question. Trump: John Roberts, go ahead, John. No, John Roberts, go ahead. CNN’s fake news, I don’t take question from CNN. CNN is fake news, I don’t take questions from CNN. John Roberts of Fox, let’s go to a real network. Acosta: We’re a real network, too, sir. Then Roberts went ahead with his question, asking Pres. Trump if he hopes to have a better relationship with Russia as Vladimir Putin continues to occupy Crimea. Putin and Trump will meet on Monday in Helsinki, Finland. It didn’t appear that any other journalist present at this particular conference came to the defense of Acosta and CNN despite the president’s criticism of him and his network. But FBN anchor Trish Regan has defended Acosta in the past, and FNC anchor Shep Smith has defended CNN in the past. 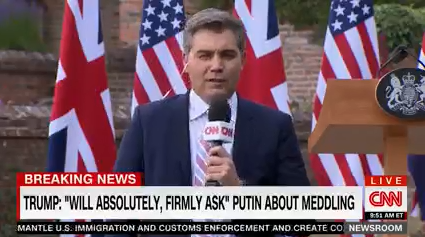 While Trump told Acosta “he doesn’t take questions from CNN,” he actually took one from CNN’s Jeremy Diamond the day before. It was about Crimea. Diamond: THANK YOU, JEREMY DIAMOND WITH CNN, THANK YOU… THEY ARE TOTALLY CONTROLLED BY RUSSIA, WOULD YOU WILL WILLING TO BE MORE SPECIFIC ABOUT THE COMMITMENTS THAT YOU SECURED TODAY? IS THERE A UPDATED TIME LINE? Trump: NO, MANY OF THEM, IN FACT GERMANY WILL BE IN 2028 OR 2030. I THINK IT IS A VERY EFFECTIVE WAY TO DEAL, BUT I DIDN’T DEAL QUICK LIKE YOU SAID. I HAVE GREAT RESPECT FROM GERMANY. BOTH OF MY PARENTS ARE FROM THE EU. THEY DON’T TREAT US GREAT IN TRADE. IF THEY DON’T NEGOTIATE IN GOOD FAITH, IT WILL BE SOMETHING HAVING TO DO WITH ALL OF THE MILLIONS OF CARS COMING INTO THE COUNTRY AND BEING TAXED AS A NEAR ZERO LEVEL. I’M NOT NEGOTIATING. I JUST WANT FAIRNESS. WE’RE PAYING FOR FAR TOO MUCH OF NATO, BUT NATO IS HELPING EUROPE MORE THAN US. AT THE SAME TIME IT IS GOOD FOR US.